Segment Displays contain LEDs arranged in a specific fashion such that, various characters or shapes can be displayed, by turning ON selective segments in different combinations. Shape of the LED is rectangular (to appear as a segment).Generally, these are used to display numbers. As of now, alpha-numeric characters can also be displayed using 16-Segment display. 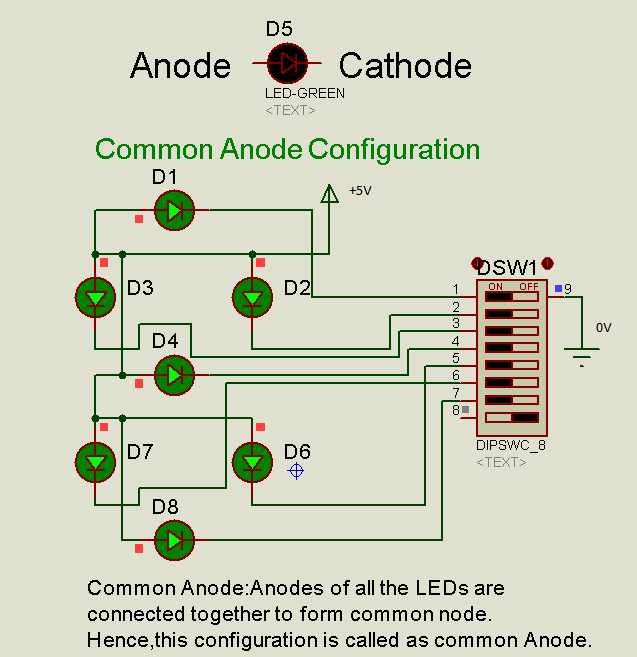 Basically, there are two types of displays based on common node of LEDs inside the display.Â The configurations shown below are for Seven segment displays, which contain seven segments and a dot point (decimal point) to show floating values. Each segment is assigned with an alphabet for identification with respect to the pin-out in the available packages depending on the size and number of segments of the display.Â This segment identification is same for both common anode and common cathode displays. characters that can be framed using the display increases. sixteen Segment displays. 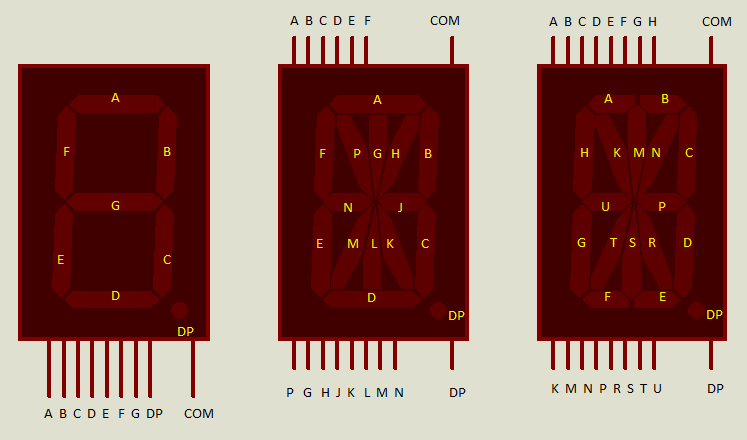 Lower versions (version 7.0) contain only seven segment displays. handy while presenting the projects or finalizing the circuits. 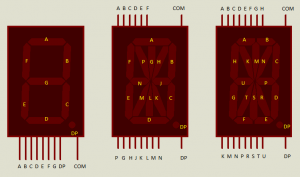 displays(the segment pins of multiple single digit displays are combined, leaving the common node pins separately). This technique reduces the number of pins required by the control circuit IC to interface with the display. 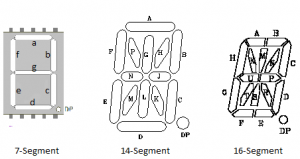 Multiplexed packages reduces the PCB layout complexity and soldering work. These multiplexed displays are generally named after their number of digits. For example, 2 Digit display contains two single digits multiplexed. Segment displays are found in components under the category of â€˜Optoelectronicsâ€™. The description of the display gives information about its common node, i.e., whether it is common cathode or common anode, number of digits, color of the LEDs. Step 2: Click on Pick devices â€˜Pâ€™ . Step 3: Type Segment in the Keyword textbox and select the required display. 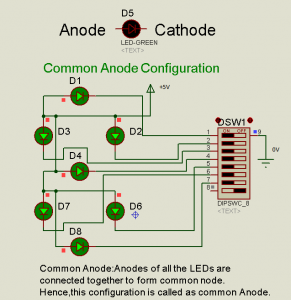 The technical parameters of LEDs of the segments like Forward Voltage Drop and Forward current are available in the datasheets. 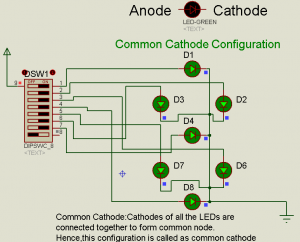 Using those parameters and depending on the voltage level of the IC that is used to drive the segment, a series resistance has to be connected to each LED segment for its safe operation while implementing in hardware. Generally, as a thumb rule 330â„¦ resistance is sufficient when the voltage level of the driver IC or the microcontroller is 5V.This value is obtained from the formula used in the previous chapter (Chapter 2 on LEDs). Step 3: Type Segment in the Keyword textbox and select the 1 Digit seven segment display with common anode and common cathode. Step 4: Select 8-element DIP Switches with common terminal. 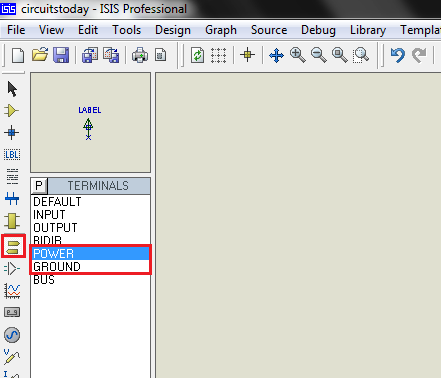 Step 5:Select power and ground terminals from terminals tab. Step 6:Â Connect the circuit as per the circuit diagram. Step 7:Â Run the simulation. Similarly, other segment displays can also be used. 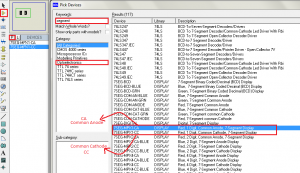 Using multiplexed displays require microcontrollers. 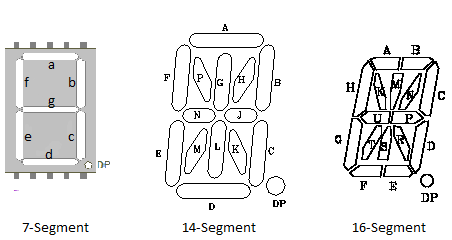 But, the technique can be explained with discrete components similar to previous examples. Using microcontrollers will be explained after covering few basic chapters. 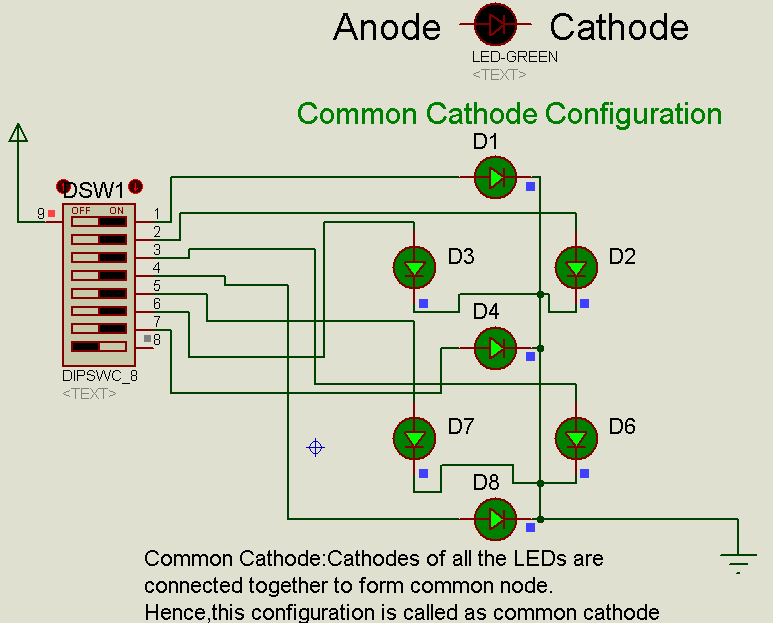 Cathode display, 8- Element DIP Switch. Step 4: Select power and ground terminals from terminals tab. Step 5: Connect the circuit as per the circuit diagram. rate) that is not recognized by the naked eye. This technique is applicable for all the displays.